You have to understand the gravity of this situation, because only in this way you'll be able to give your best in this strategy game. Make a simple demand, win each battle you fight and make your king pround of your work don't hesitate to regain your rename if you lost some fights. Because of his health condition and the age, the king requires an army of soldier to be their watchmans, but they don't have to be any knights. Go in there in a preparation session where you'll train their skills to be able to defend with loyalty their beloved protected. For the beginnig you'll select your people from the village while you advance you'll have other possibilities. So choose the ones you like the most and then practice with them before the tournament star. The area you'll train them will include the reading if you want, the art of handling a sword, the archery, the boxing and many others. 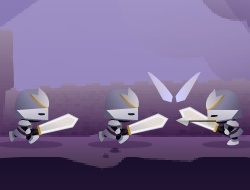 Upgrade your level at each knight and make sure you defeat your enemy with those gained skills you've got. Accomplish the given mission and take those challenges. The kings league 7.33 between 0 and 10 based on 3 votes.